1. Vertical filter film to polarize the light as it enters. 2. Glass substrate with indium tin oxide (ITO) electrodes. The shapes of these electrodes will determine the dark shapes that will appear when the LCD is turned on. Vertical ridges are etched on the surface so the liquid crystals are in line with the polarized light. 3. Twisted nematic liquid crystals. 5. 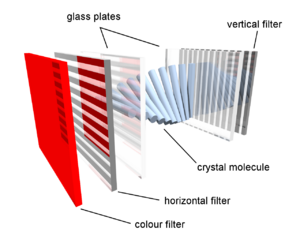 Horizontal filter film to block/allow through light. 6. Reflective surface to send light back to viewer. A liquid crystal display (LCD) is a thin, flat display device made up of any number of color or monochrome pixels arrayed in front of a light source or reflector. It is prized by engineers because it uses very small amounts of electric power, and is therefore suitable for use in battery-powered electronic devices. Liquid crystal displays are one of the reasons laptop computers have been so successful. Without this creation, we could not have the compactness for portable computers. Some of the earlier portable computers included a small CRT monitor and were rather bulky. In the future, LCDs will be used more, not only for computers but also for HD televisions. As technology and production becomes less expensive, the cost of a flat screen computer monitor or a HD television will keep going down. It is quite possible that eventually LCDs will completely replace the traditional CRT, just as the transistor replaced the vacuum tube. Each pixel of an LCD consists of a layer of liquid crystal molecules aligned between two transparent electrodes, and two polarizing filters, the axes of polarity of which are perpendicular to each other. With no liquid crystal between the polarizing filters, light passing through one filter would be blocked by the other. The surfaces of the electrodes that are in contact with the liquid crystal material are treated so as to align the liquid crystal molecules in a particular direction. This treatment typically consists of a thin polymer layer that is unidirectionally rubbed using a cloth (the direction of the liquid crystal alignment is defined by the direction of rubbing). Before applying an electric field, the orientation of the liquid crystal molecules is determined by the alignment at the surfaces. In a twisted nematic device (the most common liquid crystal device), the surface alignment directions at the two electrodes are perpendicular, and so the molecules arrange themselves in a helical structure, or twist. Because the liquid crystal material is birefringent (i.e. light of different polarizations travels at different speeds through the material), light passing through one polarizing filter is rotated by the liquid crystal helix as it passes through the liquid crystal layer, allowing it to pass through the second polarized filter. The first polarizing filter absorbs half of the light, but otherwise the entire assembly is transparent. When a voltage is applied across the electrodes, a torque acts to align the liquid crystal molecules parallel to the electric field, distorting the helical structure (this is resisted by elastic forces since the molecules are constrained at the surfaces). This reduces the rotation of the polarization of the incident light, and the device appears gray. If the applied voltage is large enough, the liquid crystal molecules are completely untwisted and the polarization of the incident light is not rotated at all as it passes through the liquid crystal layer. This light will then be polarized perpendicular to the second filter, and thus be completely blocked and the pixel will appear black. By controlling the voltage applied across the liquid crystal layer in each pixel, light can be allowed to pass through in varying amounts, correspondingly illuminating the pixel. With a twisted nematic liquid crystal device it is usual to operate the device between crossed polarizers, such that it appears bright with no applied voltage. With this setup, the dark voltage-on state is uniform. The device can be operated between parallel polarizers, in which case the bright and dark states are reversed (in this configuration, the dark state appears blotchy). Both the liquid crystal material and the alignment layer material contain ionic compounds. If an electric field of one particular polarity is applied for a long period of time, this ionic material is attracted to the surfaces and degrades the device performance. This is avoided by applying either an alternating current, or by reversing the polarity of the electric field as the device is addressed (the response of the liquid crystal layer is identical, regardless of the polarity of the applied field). 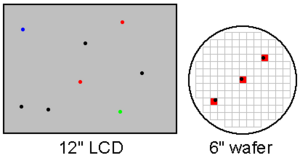 When a large number of pixels is required in a display, it is not feasible to drive each directly since then each pixel would require independent electrodes. Instead, the display is multiplexed. In a multiplexed display, electrodes on one side of the display are grouped and wired together (typically in columns), and each group gets its own voltage source. On the other side, the electrodes are also grouped (typically in rows), with each group getting a voltage sink. The groups are designed so each pixel has a unique, unshared combination of source and sink. The electronics, or the software driving the electronics then turns on sinks in sequence, and drives sources for the pixels of each sink. Important factors to consider when evaluating an LCD monitor include resolution, viewable size, response time (sync rate), matrix type (passive or active), viewing angle, color support, brightness and contrast ratio, aspect ratio, and input ports (e.g. DVI or VGA). 1904: Otto Lehmann publishes his work "Liquid Crystals"
1911: Charles Mauguin describes the structure and properties of liquid crystals. 1936: The Marconi Wireless Telegraph Company patents the first practical application of the technology, "The Liquid Crystal Light Valve." 1962: The first major English language publication on the subject "Molecular Structure and Properties of Liquid Crystals," by Dr. George W. Gray. Pioneering work on liquid crystals was undertaken in the late 1960s by the UK's Royal Radar Establishment at Malvern. The team at RRE supported ongoing work by George Gray and his team at the University of Hull who ultimately discovered the cyanobiphenyl liquid crystals (which had correct stability and temperature properties for application in LCDs). The first operational LCD was based on the Dynamic Scattering Mode (DSM) and was introduced in 1968 by a group at RCA in the United States, headed by George Heilmeier. Heilmeier founded Optel, which introduced a number of LCDs based on this technology. In December 1970, the twisted nematic field effect in liquid crystals was filed for patent by M. Schadt and W. Helfrich, then working for the Central Research Laboratories of Hoffmann-LaRoche in Switzerland (Swiss patent No. CH532261). James Fergason at Kent State University filed an identical patent in the U.S. in February 1971. 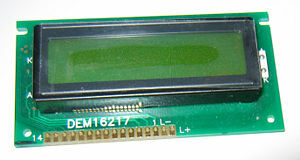 In 1971 the company of Fergason ILIXCO (now LXD Incorporated) produced the first LCDs based on the TN-effect, which soon superseded the poor-quality DSM types due improvements of lower operating voltages and lower power consumption. In the United States in 1972, T. Peter Brody produced the first active-matrix liquid crystal display panel. In 2005 Mary Lou Jepsen developed a new type of LCD display for the One Laptop Per Child project to reduce power consumption and manufacturing cost of the Children's Machine. This display uses a plastic diffraction grating and lenses on the rear of the LCD to illuminate the colored subpixels. This method absorbs very little light, allowing for a much brighter display with a lower powered backlight. Replacing the backlight with a white LED allows for reduced costs and increased durability as well as a wider color gamut. 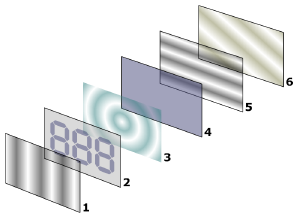 In color LCDs, each individual pixel is divided into three cells, or subpixels, which are colored red, green, and blue, respectively, by additional filters (pigment filters, dye filters and metal oxide filters). Each subpixel can be controlled independently to yield thousands or millions of possible colors for each pixel. Older CRT monitors employ a similar method. Color components may be arrayed in various pixel geometries, depending on the monitor's usage. If software knows which type of geometry is being used in a given LCD, this can be used to increase the apparent resolution of the monitor through subpixel rendering. This technique is especially useful for text anti-aliasing. LCDs with a small number of segments, such as those used in digital watches and pocket calculators, have a single electrical contact for each segment. An external dedicated circuit supplies an electric charge to control each segment. This display structure is unwieldy for more than a few display elements. Small monochrome displays such as those found in personal organizers, or older laptop screens have a passive-matrix structure employing supertwist nematic (STN) or double-layer STN (DSTN) technology (DSTN corrects a color-shifting problem with STN). Each row or column of the display has a single electrical circuit. The pixels are addressed one at a time by row and column addresses. This type of display is called a passive matrix because the pixel must retain its state between refreshes without the benefit of a steady electrical charge. As the number of pixels (and, correspondingly, columns and rows) increases, this type of display becomes less feasible. Very slow response times and poor contrast are typical of passive-matrix LCDs. High-resolution color displays such as modern LCD computer monitors and televisions use an "active matrix" structure. A matrix of thin-film transistors (TFTs) is added to the polarizing and color filters. Each pixel has its own dedicated transistor, allowing each column line to access one pixel. When a row line is activated, all of the column lines are connected to a row of pixels and the correct voltage is driven onto all of the column lines. The row line is then deactivated and the next row line is activated. All of the row lines are activated in sequence during a refresh operation. Active-matrix displays are much brighter and sharper than passive-matrix displays of the same size, and generally have quicker response times, producing much better images. Twisted nematic displays contain liquid crystal elements that twist and untwist at varying degrees to allow light to pass through. When no voltage is applied to a TN liquid crystal cell, the light is polarized to pass through the cell. In proportion to the voltage applied, the LC cells twist up to 90 degrees changing the polarization and blocking the light's path. By properly adjusting the level of the voltage almost any grey level or transmission can be achieved. 3LCD is a video projection system that uses three LCD microdisplay panels to produce an image. It was adopted in 1995 by numerous front projector manufacturers and in 2002 by rear projection TV manufacturers for its compactness and image quality. 3LCD is an active-matrix, HTPS (high-temperature polysilicon) LCD projection technology. It inherits sharp images, brightness and excellent color reproduction from its active matrix technology. Deeper blacks are contributed by the HTPS technology. The 3LCD website describes the technology in detail and is supported by various companies including 3LCD manufacturers and vendors. In-plane switching is an LCD technology that aligns the liquid crystal cells in a horizontal direction. In this method, the electrical field is applied through each end of the crystal, but this requires two transistors for each pixel instead of the one needed for a standard thin-film transistor (TFT) display. This results in blocking more transmission area requiring brighter backlights, which consume more power making this type of display undesirable for notebook computers. Some LCD panels have defective transistors, causing permanently lit or unlit pixels which are commonly referred to as stuck pixels or dead pixels respectively. Unlike integrated circuits, LCD panels with a few defective pixels are usually still usable. It is also economically prohibitive to discard a panel with just a few defective pixels because LCD panels are much larger than ICs. Manufacturers have different standards for determining a maximum acceptable number of defective pixels. The following table presents the maximum acceptable number of defective pixels for IBM's ThinkPad laptop line. LCD panels are more likely to have defects than most ICs due to their larger size. In this example, a 12-inch SVGA LCD has eight defects and a six-inch wafer has only three defects. However, 134 of the 137 dies on the wafer will be acceptable, whereas rejection of the LCD panel would be a zero percent yield. The standard is much higher now due to fierce competition between manufacturers and improved quality control. An SVGA LCD panel with four defective pixels is usually considered defective and customers can request an exchange for a new one. Some manufacturers, notably in South Korea where some of the largest LCD panel manufacturers are located (such as LG), now have "zero defective pixel guarantee" and would replace a product even with one defective pixel. Even where such guarantees do not exist, the location of defective pixels is important. A display with only a few defective pixels may be unacceptable if the defective pixels are near each other. Manufacturers may also relax their replacement criteria when defective pixels are in the center of the viewing area. A French company, Nemoptic, has developed another zero-power, paper-like LCD technology that has been mass-produced in Taiwan since July 2003. This technology is intended for use in low-power mobile applications such as e-books and wearable computers. Zero-power LCDs are in competition with electronic paper. Kent Displays has also developed a "no power" display that uses Polymer Stabilized Cholesteric Liquid Crystals (ChLCD). The major drawback to the ChLCD display is slow refresh rate, especially with low temperatures. While CRTs are capable of displaying multiple video resolutions without introducing artifacts, LCD displays produce crisp images only in their "native resolution" and, sometimes, fractions of that native resolution. Attempting to run LCD display panels at non-native resolutions usually results in the panel scaling the image, which introduces blurriness or "blockiness." LCD displays have a lower contrast ratio than that on a plasma display or CRT. This is due to their "light valve" nature: some light always leaks out and turns black into gray. In brightly lit rooms the contrast of LCD monitors can, however, exceed some CRT displays due to higher maximal brightness. LCDs have longer response time than their plasma and CRT counterparts, older displays creating visible ghosting when images rapidly change; this drawback, however, is continually improving as the technology progresses and is hardly noticeable in current LCD displays with "overdrive" technology. Most newer LCDs have response times of around 8 milliseconds. Overdrive technology on some panels can produce artifacts across regions of rapidly transitioning pixels (e.g. video images) that looks like increased image noise or halos. This is a side effect of the pixels being driven past their intended brightness value (or rather the intended voltage necessary to produce this necessary brightness/color) and then allowed to fall back to the target brightness in order to enhance response times. LCD display panels have a limited viewing angle, thus reducing the number of people who can conveniently view the same image. As the viewer moves closer to the limit of the viewing angle, the colors and contrast appear to deteriorate. However, this negative has actually been capitalized upon in two ways. Some vendors offer screens with intentionally reduced viewing angle, to provide additional privacy, such as when someone is using a laptop in a public place. Such a set can also show two different images to one viewer, providing a three-dimensional effect. Some users of older (around pre-2000) LCD monitors complain of migraines and eyestrain problems due to flicker from fluorescent backlights fed at 50 or 60 Hz. This does not happen with most modern displays which feed backlights with high-frequency current. LCD screens occasionally suffer from image persistence, which is similar to screen burn on CRT and plasma displays. This is becoming less of a problem as technology advances, with newer LCD panels using various methods to reduce the problem. Sometimes the panel can be restored to normal by displaying an all-white pattern for extended periods of time. Some light guns do not work with this type of display since they do not have flexible lighting dynamics that CRTs have. However, the field emission display will be a potential replacement for LCD flat-panel displays since they emulate CRTs in some technological ways. Some panels are incapable of displaying low-resolution screen modes (such as 320 by 200 pixels). However, this is due to the circuitry that drives the LCD rather than the LCD itself. Consumer LCD monitors are more fragile than their CRT counterparts, with the screen especially vulnerable. However, lighter weight makes falling less dangerous, and some displays may be protected with glass shields. Brody, T.P. “Birth of the Active Matrix.” Information Display 13:1 (1997): 28-32. Development of Liquid Crystal Displays - George Gray, Hull University – Freeview video by the Vega Science Trust. History of "Liquid crystal display"
This page was last modified on 26 July 2018, at 22:38.